Gupta dynasty is the earliest of all the dynasties that existed in the Indian history. As the records report, the Guptas ruled from 4th to 6th Century CE in the Northeastern, Central and western parts of India giving an all new picture to Indian architecture and more. Chandragupta I was the first ever ruler of the Gupta dynasty who was later succeeded by his son Samudra Gupta. The era of the Guptas invented the decimal system and contributed greatly to metallurgy, mathematics and the science of metallurgy. In this blog, we have focused on Gupta art and architecture – the monuments built during the Gupta dynasty. The period of Gupta Empire was regarded as the Golden Age of Indian art and architecture. Gupta architecture was quite diverse in its style, features and design. This diversity cleared the air that the building of Hindu temples was yet to evolve from its formative stage during the period of future dynasties. Nevertheless, it was the Guptas who started the era of building Hindu temples in the country using rock-cut architectural styles. The temples, adorned with elaborate carvings and towers were dedicated to Hindu Gods. To our misfortune only a few temples of the period survive today. Udayagiri Caves dates to the 5th Century CE and is considered as the oldest Hindu temples surviving in the modern age. Situated near Vidisha in the state of Madhya Pradesh, one of these 20 rock-cut caves has one of the famous sculptures of Gupta period, the sculpture of Vishnu as an incarnation of a boar-headed Varaha. The panel around measures 7m X 4m and the figure in center is carved in round shape symbolizing Vishnu rescuing the Earth (Goddess Bhudevi) by defeating a snake-like monster. Today Udayagiri Caves is one of the most important monuments of the Gupta Period protected by the Archaeological Survey of India. How to Reach: To explore the archaeological site, fly to Indore and choose the best suited option from train, bus or car to Udayagiri. We would recommend hiring a car or boarding a bus to Udayagiri. If you want to visit the caves in moderate weather conditions, now is the time. Book your last minute flights to Indore and explore the monuments of Gupta Dynasty. We can’t get away without talking about the first Buddhist cave monument in India – the Ajanta Caves. 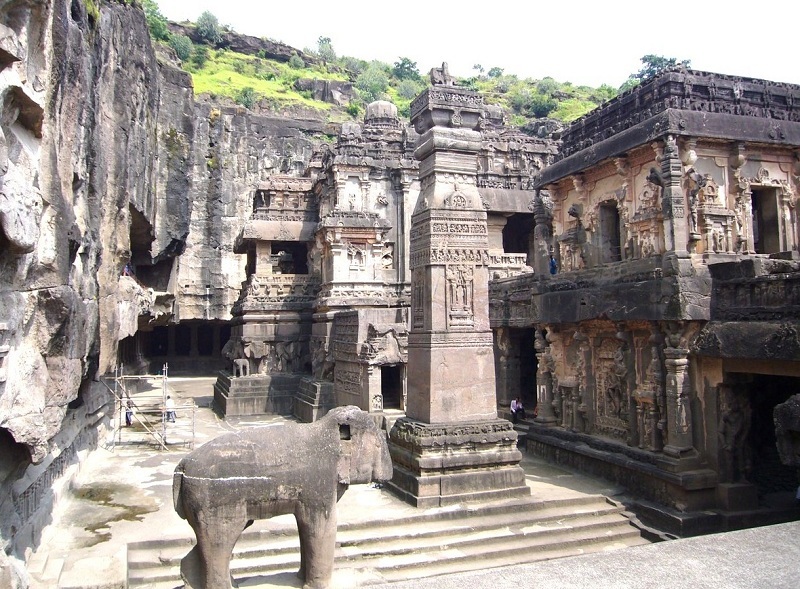 Located in the Aurangabad District of Maharashtra, Ajanta Caves dates back its establishment from the period of 2nd Century BCE to 7th Century CE. You will find some of the finest and earliest examples of Indian wall painting. These paintings and sculptures were (and still) regarded as great Buddhist religious art and had great artistic influence. During Gupta dynasty (in the 5th and 6th centuries CE), some of the most important caves were added. The 29 rock-cut caves were created in a row following the river bed of Waghora towards North-West Deccan. The central point of the paintings was to depict the important scenes from the life of Buddha. The first cave comprises of a columned shrine having a flat-muffled column capitals – built in typical Gupta style of architecture. There are some other caves added with a touch of Gupta architecture like the 19th cave having relief panels and rich carvings depicting scenes of Buddhist lore. How to reach: Book cheap flights to Mumbai, the nearest international airport from the archaeological site and hire a car or board a train to reach your destination. Postpone the meeting for which you booked business class flight to Mumbai or spend a day extra to explore the historic Ajanta Caves. The Gupta craftsmen wanted to make some more artistic inventions after the cave temples and that was evident in the foundation of the formative stage of Hindu temples. Being the first Indian dynasty to start building free-standing temples for Hindu gods, the Gupta rulers along with their skilled architects initiated a whole new tradition of Indian temple architecture which lasted for centuries. A notable point about the temples built during the Gupta period is that the temples were not made as a congregation but an adobe for a Hindu deity. The temple or Devalaya, as it was called back then, allowed priests and individuals to give offering to the gods such s prayers, food and flowers. The architecture of Gupta temples had a sacred statue or idol of God housed in a small, windowless space called garbhagriha. Here are the most important temples built during the Gupta dynasty that you must visit. Located in Lalitpur town, Deogarh in the state of Uttar Pradesh, Dasavatar Temple was established by Captain Charles Strahan and named by Alexander Cunningham. The large temple was designed with typical Gupta art and architectural style having a cubical garbhagriha and without a Shikhara. The temple depicts ten avatars (incarnations) of Lord Vishnu, thus given the name Dasavatara (10 forms). How to Reach: To visit the largest surviving temple of the Gupta period, book cheap flights to Lucknow Airport and take a train to Deogarh. Bhitargaon Temple in Kanpur City of Uttar Pradesh is one of the oldest Hindu temples existing today. Built in the late 5th Century CE during the Gupta period, the temple was entirely built using bricks. Although its upper portion is damaged, the curved and four-sided Shikhara tower still maintains the gavaksha niches. How to Reach: You can book your flight tickets to Gwalior or Lucknow and head on towards Kanpur via road. Located 13 kilometers from Varanasi, Dhamekha Stupa is one of the stupas (Buddhist temple) in Sarnath which marks the Rishipattana or deer park, the place where Gautam Buddha presented his first sermon. Dated somewhere around 1026 AD, Dhamekha was earlier called as Dharmachakra Stupa. The known archaeologist of the ancient age, Alexander Cunningham bored a shaft into the center of the foundation in search of a relic but rather found a 91cm slab having an inscription – ‘Ye Dharma Hetu Prabhava Hetu’, which was noted to be an inscription from the 6th or 7th century. How to reach: Book cheap flight tickets to Lucknow and cover the 320 kilometers distance to Sarnath (Varanasi) by train or car. Various other temples during the Gupta Period include names like Vishnu Temple of Tigawa in Jabalpur, Parvati Temple of Nachria in Kathura, Lakshman Temple in Raipur, Shiva Temple in Bhumara, Bhitari Temple in Ghazipur and Shiva Temple in Koh.